Mining induced seismicity and rockbursting significantly increased in the LKAB Kiirunavaara Mine when mining production progressed beyond 700 m depth. Since 2008, significant work was done at LKAB to better understand their induced seismicity. It has been identified that the majority of seismic events in the mine are likely caused by the interaction of mining excavations and structural geology. Two complimentary PhD projects were initiated at Luleå University of Technology to address the cause of the seismicity experienced at the mine, with one concentrating on mine seismology and one on rock mechanics. The rock mechanics project concentrates on quantifying relationships between mining sequences, geomechanical and geological conditions, stress changes and induced seismicity at the mine. During the course of this research project, significant use was made of “unconventional” forms of data, i.e. overbreak in tunnels measured using LiDAR, geostatistical analysis of various measurements from drillcore, seismic event locations, locations of falls of ground and their identified causes etc. Unlike the initial hypothesis that seismicity was strongly influenced by geological structures (faults), it was found that large clay alteration zones were the main geological feature influencing rock mass behaviour. Including these clay zones in the numerical stress analysis model showed that the stress field was modified in a way that was consistent with the field observations. This project highlighted the deficiencies of conventional rock mass property definition at the scale of the Kiruna mine. The so-called unconventional data enabled large scale rock mass behavioural patterns to be detected, and correlation of this behaviour with similar scale stiffness features (in this case – clay alteration zones) detected through geostatistical analysis of drillcore, enabled more suitable definition of zoning in the mine scale stress analysis model. Preliminary results from passive seismic tomography indicated that this technique could prove useful in delineating rock mass stiffness zone boundaries at the mine scale. Far-field stresses are those present in a volume of rock prior to excavations being created. Estimates of the orientation and magnitude of far-field stresses, often used in mine design, are generally obtained by single-point measurements of stress, or large-scale, regional trends. Point measurements can be a poor representation of far-field stresses as a result of excavation-induced stresses and geological structures. For these reasons, far-field stress estimates can be associated with high levels of uncertainty. The purpose of this thesis was to investigate the feasibility and limitations of calibrating far-field stress estimates through tunnel deformation measurements captured using LiDAR imaging. A method that estimates the orientation and magnitude of excavation-induced principal stress changes through back-analysis of deformation measurements from LiDAR imaged tunnels was developed and tested using synthetic data. If excavation-induced stress change orientations and magnitudes can be accurately estimated, they can be used in the calibration of far-field stress input to numerical models. LiDAR point clouds have been proven to have a number of underground applications, thus it is desired to explore their use in numerical model calibration. The back-analysis method was founded on the superposition of stresses and requires a two- dimensional numerical model of the deforming tunnel. Principal stress changes of known orientation and magnitude are applied to the model to create calibration curves. Estimation can then be performed by minimizing squared differences between the measured tunnel and sets of calibration curve deformations. In addition to the back-analysis estimation method, a procedure consisting of previously existing techniques to measure tunnel deformation using LiDAR imaging was documented. Under ideal conditions, the back-analysis method estimated principal stress change orientations within ±5° and magnitudes within ±2 MPa. Results were comparable for four different tunnel profile shapes. Preliminary testing using plastic deformation, a rough tunnel profile, and profile occlusions suggested that the method can work under more realistic conditions. The results from this research set the groundwork for the continued development of a new, inexpensive, and efficient far-field stress estimate calibration method. This study investigates the applicability of seismic stress inversion in a mining environment with active geological structure, in order to map the spatiotemporal stress state. First Motion Stress Inversion (MOTSI) (Abers, 2001) software is utilized, whereby this research outlines methods to establish spatiotemporal domains, determine inversion reliability and sensitivity, and explore the applicability and limitations of detecting changes of the stress state through seismic stress inversion. The application of spatiotemporal discretization to the methodology allows domains to be representative of pseudo-homogeneous stress states, to increase the reliability and resolution of mapped stresses. Geological structures are established as discrete boundaries of the inversion domains, and were found to produce unique stress tensors representative of homogeneous stress states that differed from the stress states in adjacent domains. High seismic event frequency is established as a bound between temporal domains and stricter filters produce more reliable inversions. Stress tensors produced through the inversion method indicate an evolution of the stress path over time. Stress states only influenced by mining are gradual and smooth, whereas in the case of fault-slip, the evolution appears to display sharp changes at the time of the events. A significant limitation of this method is data sparsity. This is directly related to the number of filters applied to the dataset, thus a balance between filter strictness and database size must be considered. This work demonstrates the weak and brittle behaviour of the faults and that interconnectivity of geological structure is significant in the seismic expression of the failure mechanism and can be captured through the inversion method. Through more research, the implementation of this method in real-time may bring insight as to which spatial domains or structures are at risk of fault slip, in addition to mapping the stress state. Overall, through an improved understanding of the stress state adjacent to weak structures, it is expected that seismic stress inversion will lead to greater reliability of stability analysis, consequently improving the design process for deep mines. Strainbursts are a significant hazard to mining operations in Ontario. They account for the greatest proportion of significant injuries in Ontario mines and there is a need to improve our understanding of the problem through additional research (Ministry of Labour, 2015). The objectives of this project are to identify the geological conditions associated with strainbursts and to determine the mechanisms that govern failure in order to develop mitigation strategies. It is expected that there are a number of generalized mechanisms that account for the majority of strainburst events and that identifying them will form the basis for developing mitigation strategies. For the intern, the project will provide access to mines for mapping of geological conditions of relevant strainburst cases, and the skills and expertise from working on an industrially relevant problem. This project is relevant for Vale given that strainbursts are a high risk for their workers and mine operations. Strainbursting poses a risk to mines all over the world, and the research results could have a far-reaching benefit. Conventional joint mapping is a time consuming process and requires access to the rock face. In this project, we are experimenting with a rangefinder-based laser scanner to map joints, determine surface roughness characteristics, and log RQD in core boxes. Surface and underground field trials were carried out and have provided point-cloud data sets that were analyzed using software developed to automatically characterize joints and surface characteristics. With high resolution available with the laser scanner being used, it was possible to examine in detail surface profiles of joint planes in various directions and it was shown that true surface roughness could be determined. It was observed that surface roughness had distinct directional anisotropy on the joint surface, most likely a relic of the geological deformation processes that occurred in the history of the surface. Finally, a filter was developed to remove the points associated with wire mesh, a commonly used support element in mines. By removal of the mesh overlying the rock surface, analysis of both joint orientation and surface roughness could be carried out without the impact of noise introduced by the presence of mesh. These techniques contribute to the practical application of laser imaging as a method to save time and improve accuracy compared to conventional manual measurement. Current core logging is based on visual inspection and is therefore laborious and in some cases open to subjective interpretations. It is a challenge for geologists to distinguish natural fractures that result from geologic processes from mechanical fractures caused by borehole drilling. Moreover, geologists may log hundreds of metres of core each week. The primary objective of this research is to develop 3-D imaging procedures and a computer program that will facilitate fast, reproducible and unbiased observation of fractures in core. 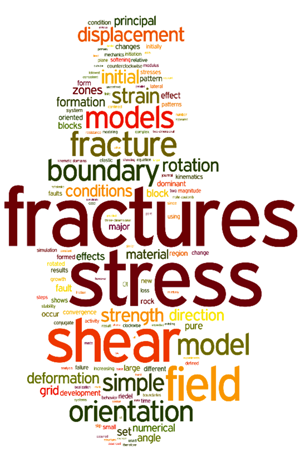 The challenge will be to isolate and analyze parameters that distinguish mechanical fractures from natural fractures. Examples of these parameters include the fracture angle, roughness and displacement. The relationship between fractures and other structures, and fractures and rock type, will also be investigated. The secondary goal of this research is to assess whether 3-D imaging has the capacity to detect economically important minerals associated with natural fractures. Classification systems have been used very effectively in geotechnical engineering in cases where use of analytical or numerical methods is not possible or feasible. Given sufficient data, and an estimate or model of how the main controlling parameters are related, they can be calibrated for design purposes. The objective of this project is to develop an understanding of all factors that affect fault stability and how they can be quantified or estimated. A ranking will be carried out and the structure of a fault stability classification system will be developed. Successful stress inversion requires use of slip vectors from seismic events conforming to a shear slip event mechanism. Correct identification of the event mechanism is not always possible using only fault plane solutions. In this research project, different moment tensor techniques are being examined, some specifically developed to work well with primarily uniaxial sensor arrays, to be used for pre-screening of events to be used in stress inversion. A common characteristic of deep mines in hard rock is induced seismicity. This results from stress changes and rock failure around excavations. Following large seismic events and blasts, there is an increased but short-term risk that additional seismicity will cause a rockburst, and therefore the policy adopted by mines is to restrict access to the affected areas for a time period after the initial event. This is the re-entry protocol. In this research project, we are carrying out detailed statistical analyses of aftershock sequences in order to develop guidelines that will enable mines to develop their own site-specific re-entry protocols. This work is being sponsored by the Ontario Workplace Safety and Insurance Board (WSIB), with the support of the Ground Control Committee of the Mines and Aggregates Safety and Health Association (MASHA) and its supporting member mines in Ontario. Seismicity at the crustal scale exhibits many of the characteristics of mine-scale seismicity. The science learned at the crustal scale is therefore equally applicable to the mine scale problem of induced seismicity. We are investigating the characteristics of seismicity in the Charlevoix region of the St. Lawrence River, which is the most seismically active region in Canada. It is the site of an ancient rift fault system and a 350 Ma meteorite impact crater. With the use of two and three dimensional stress analysis models we have replicated the complex patterns of seismicity. The mechanics of the system is applicable to other fault systems, and has resulted in insights into the new phenomenon of stress channelling. The link between seismicity and faults has long been established. However, the aim of this project has been to develop a more detailed understanding of how the characteristics of fault systems in the Creighton Deep influence the patterns of mining induced seismicity. Faults were characterized by detailed underground mapping and sampling for microfabric analysis. Seismicity data over a one year period was analyzed in detail. Numerical stress analysis models were calibrated using this data.